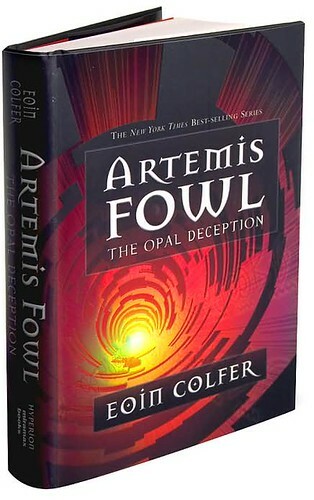 The fourth Artemis Fowl book is as wonderful as the previous three, and I continue to count Eoin Colfer as one of my favorite authors. If he writes something, I’m buying it. In the Opal Deception, Colfer takes a dramatic turn in the universe he’s created: one of the main characters dies. I won’t say who or the circumstances of the death (I’ve already given too much away as it is), but it’s a shift in a series that is as lighthearted as it is action-packed. This is for kids, after all. In Opal Deception, Artemis must face Opal Koboi again, the evil genius mastermind whose plans Artemis foiled in a previous novel. Since her capture Opal has been in sedation at a high-tech psychiatric ward. Her two goons help her escape, and Opal begins a nasty plot of revenge that targets everyone who brought her down last time. At Artemis’s side are his usual group of compadres on these adventures: his super-sized assistant/bodyguard Butler (my favorite character in the series), Captain Holly Short of the LEP, and Mulch Diggums, the dwarf with a criminal record and noisy bum flap. In book four we also see Artemis step even closer to the dark side, a move he’s been resisting yet gradually making ever since the first book. But I hope Colfer doesn’t go to far. Much of Artemis’s charm comes from his dastardly deeds and criminal ways. Sure, he’s got a soul. But if he becomes a saint, than he’s lost everything that makes him so wonderful as a character. What’s the series about? Answer: A twelve-year-old criminal mastermind. One who struggles with his own moral compass, yes, and who inevitably does the right thing in the end. But he is still a criminal mastermind. Or at least I hope he continues to be.